Interview or visit to the dentist? Interview or an hour of traffic on your way home from work? Interview or working on a Saturday? For many of us it would be hard to choose which scenario we would prefer. Why is this? Because we all perceive an interview to be just as uncomfortable, just as painful as a visit to the dentist or sitting in traffic for over an hour or working on a Saturday. Why are we so uncomfortable with the interview process when it is an inevitable step in landing that coveted job that we want so badly? I think it is because people don’t know how to properly prepare for an interview. Sure, we all may get that butterfly feeling in our stomachs right before the interview and that is normal (that means that you care), but we shouldn’t dread going to an interview. So, outside of knowing about the company (inside and out), knowing whom you are going to be interviewing with, and the inevitable questions you will be asked, i.e. why do you want to work here, how can you better prepare yourself for an interview to make the interview process more comfortable? I think an important part of being comfortable in an interview is knowing who you are, i.e. knowing what your flaws and weaknesses are as well as your good qualities. I am currently reading the book How To Wow by Frances Cole Jones, which is a good read for those of you looking to make a good impression at work and with colleagues. In Chapter 4, Jones discusses the interview process and suggests making a list of 3 words that describe yourself. I know, I know, when an interviewer asks these questions we never know how to answer them correctly – should we be honest or should we make ourselves sound better than we really are? But for this exercise just be honest. Write down 3 words that you think accurately describes you. NOTE: While it should have been easy for me to come up with three words it was rather hard. I find it very difficult to describe myself to others, but maybe this exercise will be easier for you. The next step, according to Jones, is to ask those around you whether those descriptions of yourself are accurate. Jones says that doing this will allow you to properly see how others see you, which can be completely different from how you see yourself. If I were to ask those around me whether I was reserved, some people would agree while others, those that I know very well, would laugh in my face. The reason being that when I don’t know someone well I am reserved and shy, and have been told that sometimes I look unhappy or mean. But for those who know me well, they know that in new situations I am shy and that I am not being mean. The ones who know me well see me as the talkative woman who isn’t afraid to voice her opinion, but for those who just meet me they see something completely different. So, how does doing this exercise help? For me it is helpful to know that people perceive me as reserved. Why? Because employers want people who are exactly the opposite – talkative, personable, outgoing. So, knowing that I come off as reserved and kind of bitchy helps me know that when interview time comes I need to smile a little more and talk a LOT more. Knowing how others perceive me makes it easier for me to work on my problems before stepping foot inside the interview room. Is being something that you are not easy? No, but you can work on it. While I would never want to work in a work environment where the people didn’t like me for who I was, I understand that an employer wants an employee that can go out there and talk to potential clients. So, to feel more comfortable in the interview and to have a chance at landing the job it is important to portray that image that the employer wants to see even if it isn’t you all the time. There is nothing wrong with working on your flaws, and for me that means trying to be a little more outgoing. If you find yourself nervous about the interview process try this exercise. Write down 3 words you would use to describe yourself in a work environment, ask those around you whether those are accurate perceptions, and if some of those perceptions are off try to work on being more like the word you described yourself as. You have submitted your resume, called back to see if they received it, and then, after what seems like an eternity, you FINALLY receive the call that they want to call you in for an interview. While this may seem like great news in today’s market, don’t get too excited. Remember, you always have to be prepared for an interview and the tricky questions the interviewer will have up their sleeves. 1. Why Have You Been Out of Work So Long, and Why Were You Laid Off? If you read my post Why Are Gen Yers So Unhappy you will remember me saying that Gen Yers who sit around waiting for the right job will have a hard time explaining to potential employers why they have been unemployed for so long. According to Kennedy, the interviewer may be trying to determine whether you are a “second string employee.” Kennedy states that while the employer might not come straight out and ask why you were laid off right away, if they ask any questions regarding your lay off they will likely be trying to determine whether or not you were considered a “second string employee” that was not worth keeping around. Rather than answering the interviewer honestly, Kennedy suggests that you simply suggest that you have no idea why you were laid off because you were a great, hard-working employee. I do think, however, that if you have seriously been looking for work and have been unable to find ANYTHING, then you should be honest about that aspect of your job hunting experience. Of course, if you were laid off because you stole something and can’t find a job because you don’t have reference, maybe telling the truth is not such a good idea. 2. If You Are Employed Right Now, How Are You Able to Come to an Interview? According to Kennedy, the interviewer is trying to see whether you have a pattern of short-changing and lying to employers. The best way to respond is to tell the interviewer that you have taken personal time for the interview and that you only go to interviews that seem like great opportunities and great fits. Kennedy suggests that if additional interviews are requested, you should ask for an interview time outside of normal work hours. While job hunting when you currently have a job is tricky and maybe slightly unethical in some instances, it is possible. I found my current job while I was employed by someone else. I only went on two interviews the entire time I was looking and it was only because those jobs were jobs that sounded like jobs I wanted. I didn’t go on an interview for a job I wouldn’t have taken had they offered it to me on the spot. My advice is to be picky if you are employed and have that luxury. You definitely don’t want to give off the impression that you go on any interview that you have a chance to go on when you already have a job. 3. Do You Know Anyone Who Works For Us? A lot of times we assume that having a connection on the inside will help us. According to Kennedy, having a connection on the inside will only help you if you are absolutely sure of that person’s standing within the organization. It won’t help you to have a buddy pass along your resume if that buddy is seen as a slacker within the company. Kennedy suggests that, because the employer will likely associate your friend’s traits and characteristics with you, make sure you really know your friend and their standing within the organization. 4. How Does This Positions Compare To Others You Are Applying For? Kennedy states that the “intent is to gather intel on the competitive job market or what it will take to bring you on board.” According to Kennedy there are two ways to approach this issue, you can either say that you don’t talk about other interviews or you can say that you have received other competitive offers. Personally, I don’t like either approach. The first approach makes you sound stuffy and secretive, and the second option makes you sound cocky. Of course, if you have really received another offer you should bring it up as long as you are sure it won’t ruffle any feathers. But I would tread lightly and make think through whether or not the interviewer would react positively or negatively to this. If you don’t want to discuss other interviews that you have been on, then simply suggest that you have not been on any. Sure, this may make them think that you are not as highly demanded, but at least you don’t sound like a complete tool when you say you don’t feel comfortable discussing other interviews. There are other deceptive questions that interviewers try to ask that you should check out in Jenna’s article on Forbes. The bottom line is that landing the interview does not mean that you have landed the job, so be prepared. Failing to Bring Your Resume to an Interview. Sure, you emailed the company your resume beforehand and they should have it with them when they see you, but don’t count on it. With the economy being what it is, it is likely that the employer will be interviewing many people before they get to you. This means that they may not have had time to revisit your resume before your interview and may not remember what was on it. There was one time that I went to an interview for a summer associate position without my printed resume. Low and behold they asked for a copy. It was embarrassing to have to tell them that I didn’t have it with me and would have to get back to them, so now I always make sure to come with about ten printed resumes on nice resume paper. Most of the time the interviewer will have a copy sitting right in front of him/her, but if they don’t I always offer. Not only does this make you look professional and prepared, it makes it look like you really care about getting the job. Answering Questions in One Word Answers. Again, remember that the interviewer may not have had time to look over your resume in detail. They may actually be asking questions because they are not sure of your accomplishments, education, or work experience. If they ask you, “So, where have you worked since you graduated college?” you shouldn’t simply list the companies you have worked for. Rather, you should give a little blurb about each job you have held, the positions within each job, and your achievements. This will allow the interviewer to be refreshed about your resume and will certainly lead into a more in-depth conversation. You may have worked for the nastiest boss in the world, but that doesn’t give you the right to complain about him/her to the company you are interviewing with. Venting all of your past problems makes you look like a complainer and a gossiper, and no one wants to hire a complainer or gossiper. Oftentimes the interviewer may ask you why you are thinking of leaving your current job or why you left your previous job. Rather than open up about every little thing that you hated about the other company, simply say, “I am looking for a new opportunity,” or “I am looking for a position that I can really use and develop my skills,” or “I am looking for a position where I can continue to grow, and I wasn’t able to do that at my old job.” Never should the interviewer come out thinking that you hated working for your other company or the people you worked for. NEVER! I know that interviewing is awkward and sometimes we don’t feel 100% comfortable asking the questions that we really want to ask, but the worst thing you can do in an interview is tell them that you have no questions when they ask if you do. If you are looking for some questions to ask, check out my post Questions to Ask in an Interview. If they ask you whether or not you have questions, they are likely trying to gauge your interest in the company. Saying, “No, I think you have answered all of them,” makes it sound like you are uninterested. I have been to interviews and have said that very thing, and I will tell you that I didn’t get those jobs. The interviews that I do best in, and receive job offers in, are those in which I ask questions. I will ask the typical what-is-the-culture-of-your-firm-like questions, but I will also dig deeper and ask the uncomfortable questions, like “Why is there only one female executive in the company?” While asking tougher questions related to your field is preferred, asking any questions at all is better than asking none! Think about the questions you are going to ask before you get to the interview and do your research on the company. We all know that we form opinions of people within the first few seconds of meeting them. A lot of this has to do with how they look (sad I know, but it’s true). If someone comes in for an interview with ratty hair, flip-flops, and gum in her mouth I would wonder whether she was competent to perform the job. Because the interview is the one time that you don’t want someone to form a negative opinion about you based on your looks, you need to look as professional as you can. For women this means wearing a tailored skirt suit or pants suit. By tailored I mean that it needs to fit you properly. Too often I see young women walking around the building I work in with a suit that clearly doesn’t fit them – either their pant legs are too long or too short, or their blazer is too big or too tight. While this seems minor, it is something that people will notice. Make sure that you wear a nice pair of professional heels. This means no colored wedges or flats – it means HEELS! Make sure your hair looks nice and that you are not wearing too much jewelry so as to distract the attention away from you. In law school we were told to only wear five pieces of jewelry – and earrings count as 2. So this could be a pair of pearl earings, a pearl necklace, your wedding ring, and a watch. If you have a facial piercing or a tongue piercing make sure that you ALWAYS take them out. While some of you feminists may be saying, “I shouldn’t have to look a certain way to get the job,” the fact of the matter is that you do and you should. Outside of our appearances, people judge us by our body language. You can always tells by the way someone is sitting whether they are nervous or comfortable, bored or into the conversation. Body language is the primary method of communication among human beings, and can lead to negative impressions if you don’t monitor it. Make sure you sit up straight, rest your hands comfortably on your lap, throw out the gum, don’t fidget, and ALWAYS MAKE EYE CONTACT. I am an avid believer in eye contact during conversations, and I HATE IT when I talk to people who cannot look me in the eyes . Not only does this give me the impression that they are uncomfortable around me, it makes them look completely uninterested. 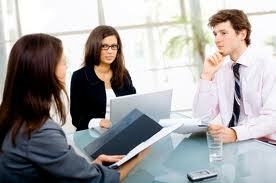 If there are two interviewers make sure to spend your eye-contact time with them equally. Paying more attention to one person over another will also send a negative message, especially if the person you are ignoring is a woman. I know that it is often hard to talk about yourself for a prolonged period of time, but that is what the interview is all about. They didn’t invite you to have a nice conversation about the Giant’s winning the Super Bowl, they invited you to hear about YOU. So, when they ask you about what makes you special or why they should hire you, don’t be afraid to take a stand and sell yourself. When I interviewed for my current job I had absolutely NO litigation experience, only corporate, in-house experience. A lot of the lawyers that interviewed me asked me why they should hire me when I had no experience in the area they would be hiring me for. Rather than saying things like “Because I am a hard worker,” or “Because I want to learn,” I told them that I had closed a million-dollar acquisition my first year as an attorney and I was up for the courtroom challenge. Be specific and tell them why you deserve the shot at the title. No one is going to do it if you don’t. Forgetting to Send a Thank You Note. Almost just as important as the interview is making sure to thank those who took the time out of their busy day to consider you for the position. The rule is that you should send out a thank you note the day that you interview, either by email (which I tend to think is more acceptable now a days) or by regular mail. You want to get these thank you’s to them ASAP so that you are fresh in their mind. Try to put something personal in every thank you note so they don’t think that you just sent a mass thank you to everyone at the company. If you bonded over the Giant’s winning the Super Bowl, then put something along the lines of “Great chatting with you about the Super Bowl. Hopefully next year our Patriots will have a better season.” Not only does this personalize the thank you note, but it tells the interviewer that you remember speaking to him or her. I interviewed for a job before getting the job that I currently have. I was actually pretty excited about the opportunity and the work sounded exciting. When I got home and prepared to send a thank you to the two attorneys that interviewed me, I couldn’t remember one of their names. I went on their website in a panic, only to find that the attorney’s names were not listed. The only person’s name that I had was the office manager who had coordinated the interviews. I sent a thank you to him, but obviously failed to send one to the attorneys. Needless to say, I didn’t get the job and I knew it was 100% my fault. Despite the fact that I thought I did well in the interview, the fact that I didn’t send a thank you note completely negated that. A lot of this is common sense, but are things that people often forget about when the interview nervousness kicks in. I know that interviewing is a tough and gruelling process, but you will see results if you make sure to take note of my suggestions. Good luck to you! The worst part about going on a job interview (in my opinion) is having to think of what questions you are going to ask. For some reason the so-what-questions-can-we-answer question always gets my blood pumping. Of course asking questions can be particularly hard if your interviewer is boring or if you find that you are somehow not all that interested in the company you are interviewing for. But, as we all know, asking your potential employer questions is the best way to know what working there will really be like. When I went on a job interview for my current job I found that when I asked a particular question they were very forthcoming and honest with their answers. They didn’t just tell me what I wanted to hear or fluff up the truth, they told it to me straight, and as a result I found the perfect fit. Remember that when an employer asks if you have any questions they are not simply trying to be nice or waste time, they are trying to see how well you looked into the company and how interested you are. I have always been of the opinion that asking questions (even if I don’t have any) is better than not asking any at all. It is likely that if you say, “No, I think you talked about everything,” the employer will see that as a red flag. In addition to sending out the red flag notification, asking questions is a way to find out if you really fit in with the company. Here are my suggestions for questions to ask in an interview. Ask About Things That Have Not Been Covered in the Interview. What will my typical day look like? What are the immediate projects or concerns that need to be addressed? Have other people in this position found anything to be particularly challenging? What are your expectations of this position for the next 12 months? How much opportunity is there to grow in this position? How will my performance be reviewed? Uncover the Companies Dirty Little Secrets (Red Flags). Which group/people will I be working close with? Why was the last person to hold this position fired/laid-off? Why have X [insert number] number of people held this position within the last year? How has your company managed during this recession? Why are there no women in the department that I may be working in? How do the older employees feel about working for a woman who is younger than they are? Now, some of you may not particularly agree with the second-to-last question, but I in fact asked that one at my last interview AND I asked the last one (in a little different way). While there were many female assistants and paralegals, there were only three female attorneys and I wanted to know why. I also wanted to know why there was no one my age working there. Did they lose a lot of clients in the last few years? Have other younger attorneys been fired? You will find that if you ask the right questions you may just land on one of the company’s dirty little secrets that makes you think twice about taking the job. What skills and experience does your ideal candidate possess? What attributes is the team looking for? Is there anything about my experience that worries you? Asking these types of questions will allow you time to address their worries and also brag about your skills one last time. Find Out if the Company’s Future is Bleak. What direction to you see this company moving in the next five years? What new products or services is the company planning on hiring? Does the company offer training session or professional development opportunities? How have the executive come to have their positions? What is your favorite part about working for the company? How have you grown professionally since starting with the company? Is there anything you wish someone would have told you before you took the job? While people do love talking about themselves, make sure that you stop asking these questions if the interviewer seems uncomfortable with it. Every interview should end with you asking about the interview process, such as “What are the next steps in the interview process?” Always express how excited you will be to hear back from them. Notice that there was nothing about salary, benefits, bonuses, or vacation on there. While we are all dying to know the answer to those questions, they are completely inappropriate to ask during the interview process. Only discuss these questions if the interviewer brings them up to you, such as when they ask you what your desired salary is. LASTLY, make sure you ask them whether or not you can provide them with additional information.